Warrington Road Club AGM at the Millstone Pub, circa 1933. 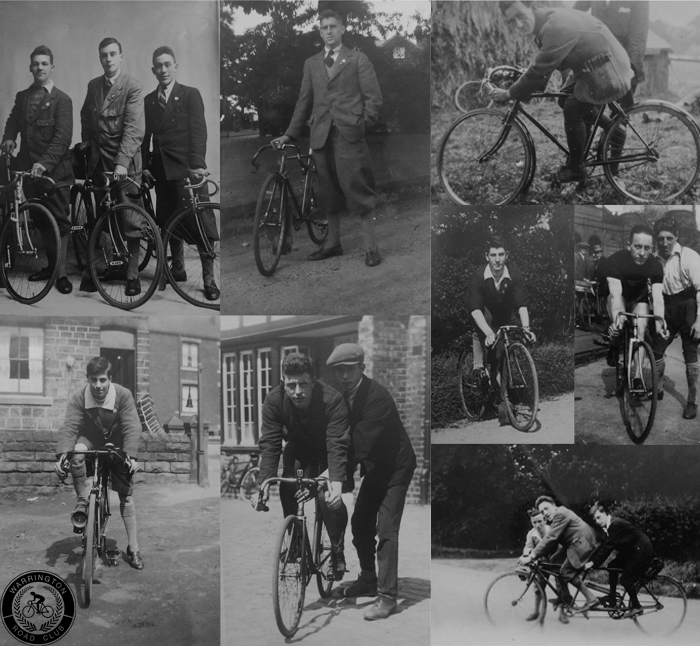 A group of cyclists got together in 1923 and formed Warrington Road Club and quickly found its way into the traditions of other such clubs of its time by organising races, club runs and social activities for members. Founding members names we know of were Harry Barker, John Ward, Walter Pritchard, George Rhodes and Rachel Rhodes; other founding members are lost in the mists of time. Within a year the club grew in members and hence so did its activities. Our growing number of members were competing in and winning races as well as the club organising our own open events and competitions. 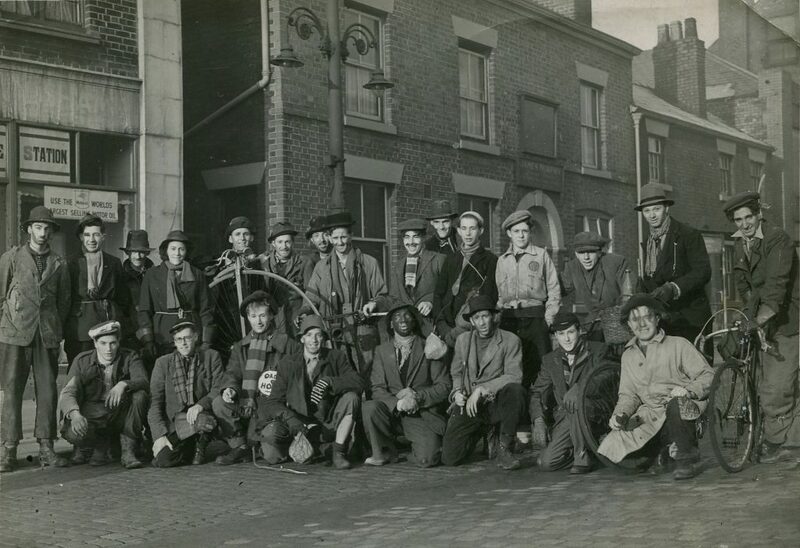 Pictured is a strong group of 51 members in 1933, presumably before an AGM, in front of the Millstone pub which was Warrington Road Club headquarters for Road Races for many years. In the front row sat down second from the right, with the white paper in his front pocket is one of the Club Founders Harry Barker. Also in the picture is another founding member George Rhodes and the school boy in the front row is Alan Barker. Within 2 years of the club forming, the club designed the local 25 course in Fearnhead which was expanded over time to suit 50 miles. In 1927 club events at 30 and 100 miles were added to the programme. A year later the club introduced standard medals, gold, silver and bronze for the first time and, at the end of that first season, five gold, six silver and twelve bronze medals were awarded. 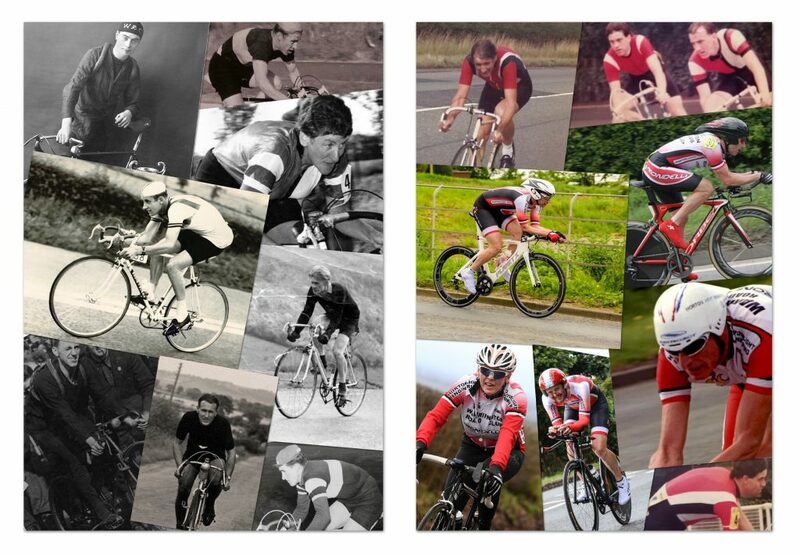 In 1929 a club hill-climb and a club 12hour event were added to the Warrington Road Club racing calendar. Providing such activities to its members and to members of all local clubs has been the club’s ethos ever since. It seems incredible now that a club could run a twelve-hour event for its own members. Warrington Road Club Hill Climb Event, Frodsham Hill, 1949. The problems of organising the event led to Harry Barker, who was a leading timekeeper, to invent the ‘finishing circuit’ system. 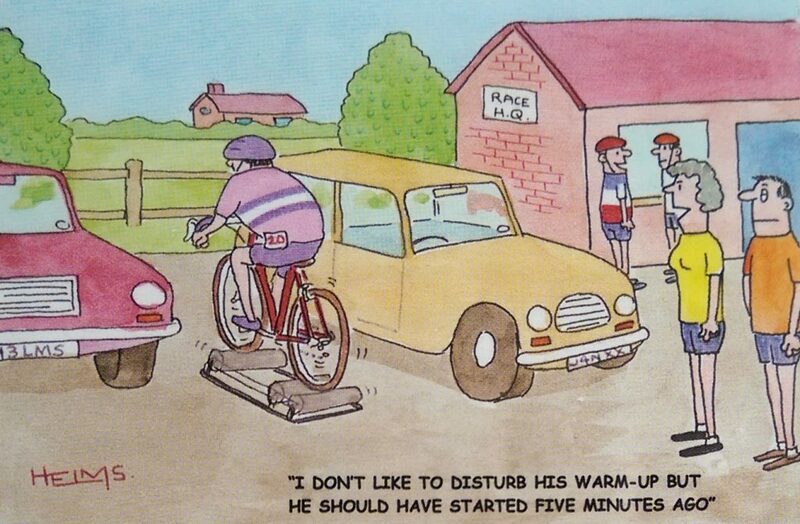 This was soon adopted by every other cycling club in the country. 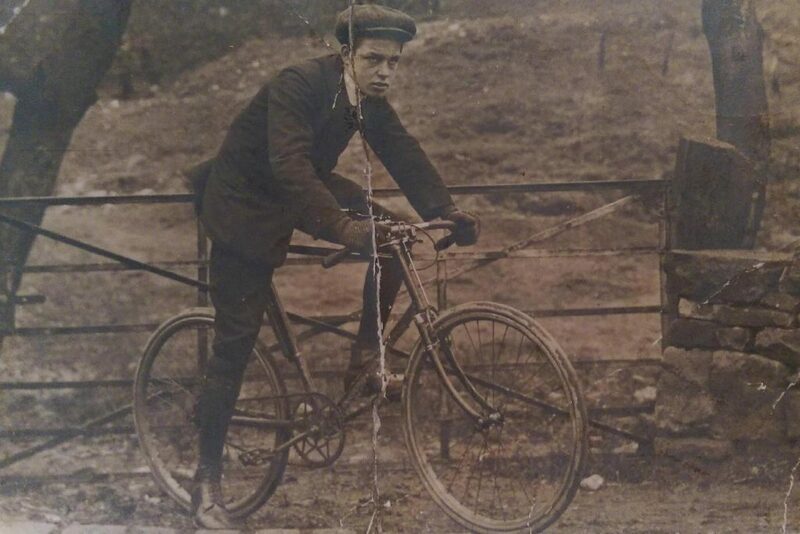 Harry Barker circa 1910, the creator of the “Finishing Circuit” in the 1920’s that is still used in modern day time trials. 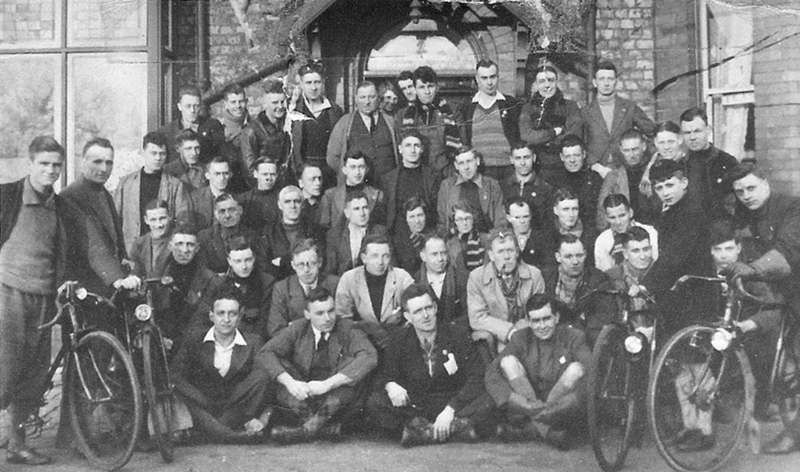 Pictured below is a number of riders, members and active racers in the club circa 1923 to 1933, which gives you a good indication of the type of kit worn, and of the quality of bikes ridden. Also interesting is the style of the photographs taken from this era. Historically, all time-trialists had to wear an all-black costume of tights and alpaca jackets. The first relaxation came in 1942 when shorts and knee-length stockings were allowed. The next change was in 1951 when shoulder-flashes in club colours were allowed. Finally, in 1953, the present day coloured racing tops were permitted when club colours for races were permitted. Warrington Road Club’s colours as far as we know were Maroon and Gold from the very beginning in 1923. In the mid-1960s a group of mainly younger riders led by Ernie Lightfoot left W.R.C. to form a new club, the Merlin R.C. In 1969 the two clubs amalgamated again. 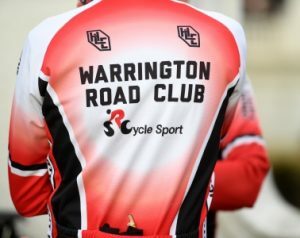 The club retained the name Warrington Road Club but changed the club colours to the present day red, white and black. The colours were randomly picked on the night of the meeting after some deliberation, as a member held up a Red, White and Black Greenall Whitley beer mat and suggested we used them as the club colours. It was agreed at that point and the club changed colours from Maroon and Gold to the Red, White and Black you see today. You’ll see from the picture, how the clubs kit and colours have changed over the years to near present day. 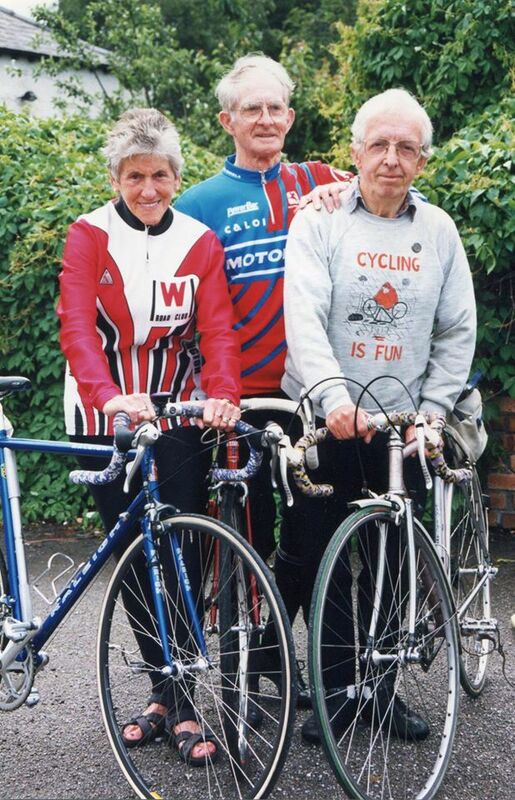 Warrington Road Club Kit from the 1920’s to Present Day. Over the Years, the club has built up a number of trophies that our own riders compete for, and also other clubs’ riders entering our open events. With 27 trophies available, from Time Trials to Road Races, Men’s, Women’s and Junior Titles, Club Events and Open Events, we are really proud to have the depth of goals for riders to strive towards. 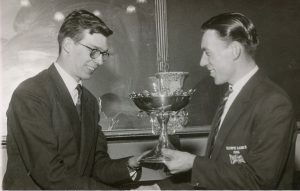 Cycling Legends, Ray Booty & Stan Brittain with the Harry Barker Trophy 1958 Club Dinner. 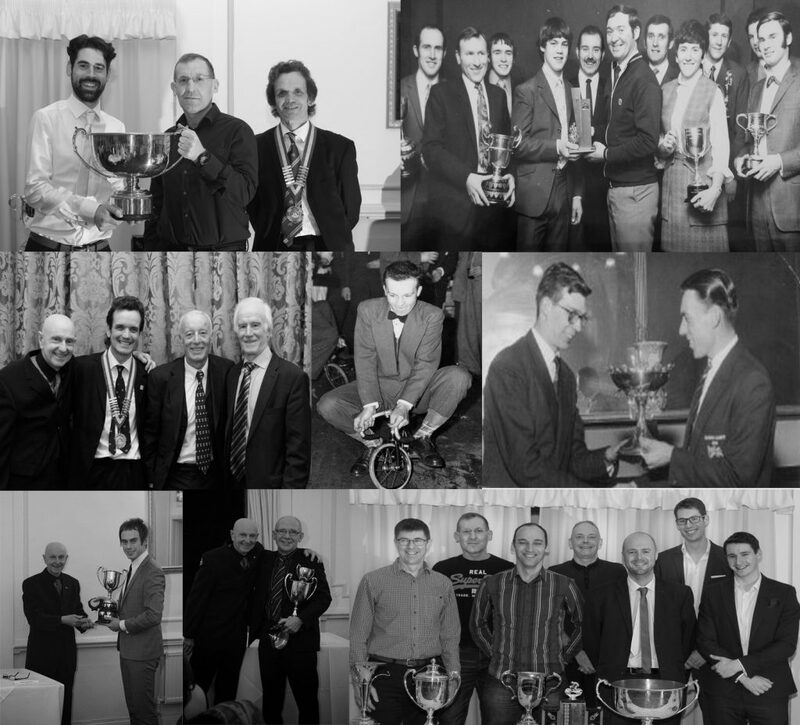 For further information on our trophies, please refer to the Club Rules within the How To Join Section and the Club Records tab for a look at the historical success of all the riders and their successes. 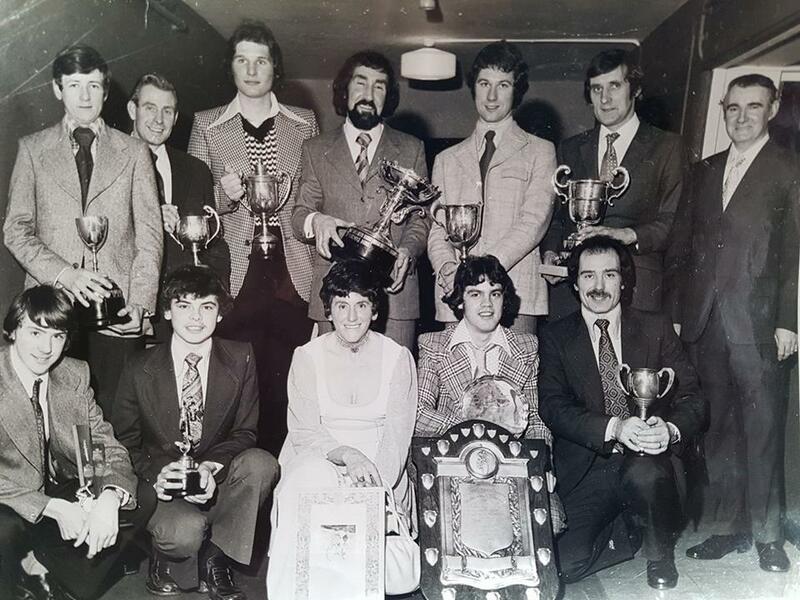 The picture is taken from the 1973 Club Dinner, pictured From Top Left to Right as you look at the picture, Brian Pownall, ?TBC? , Howard Wilkinson, Alan Boden, Alan Kemp,Ron Spencer,John Bailey Snr. Front Row John Bailey Jnr, Gary Hartles, Inez Finch, Graham Daniels, Bill Woodrow. 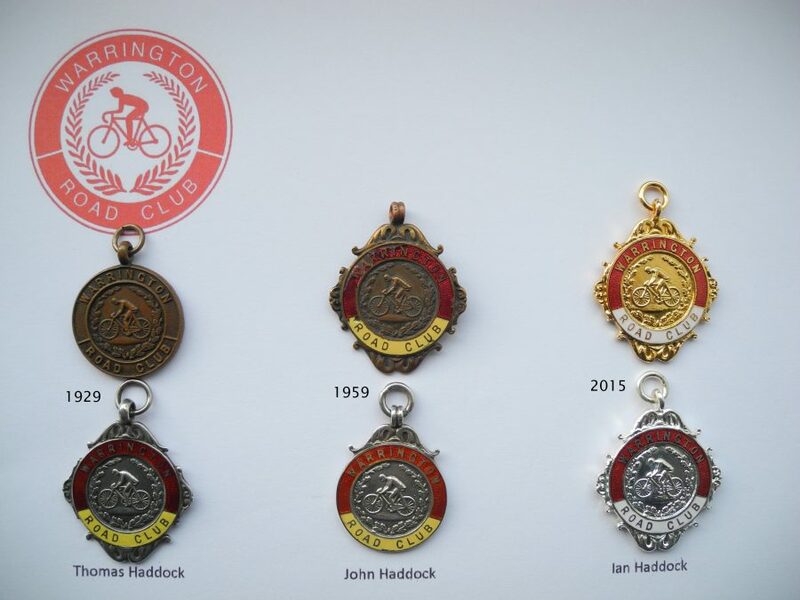 From archives we have kept, we understand that from the very beginning the Warrington Road Club badge has had the same design for a total approaching 100 years. Although smaller detail may have changed shape slightly over time, the style of the cyclist (wearing traditional racing gear of the time in the 1920’s, surrounded by a laurel wreath) has stood the test of time. Club Medals and Club Standards have been a part of the club tradition since 1927 and have been positive targets for riders each year. Gold Silver and Bronze medals are available which the club sets to a percentage of the National Record for the appropriate distance. These goals prove popular for our riders to set targets throughout the season and the medals are awarded to riders at the Annual Dinner and Presentation evening each year. Pictured are club medals spanning three family generations in the club showing the style of the medals from the 1920’s to present day. At the beginning of the war the club had 147 members. Twenty-nine of them were called up and two were killed on active service. 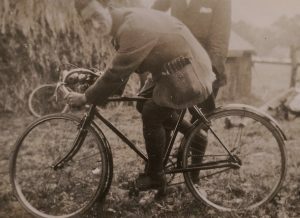 The club sent copies of the magazine ‘Cycling’ to all its members in the forces. After the War there was a large influx of new members and by 1949 the club had 227 members, 65 of whom raced, with entries of over 50 in club events. 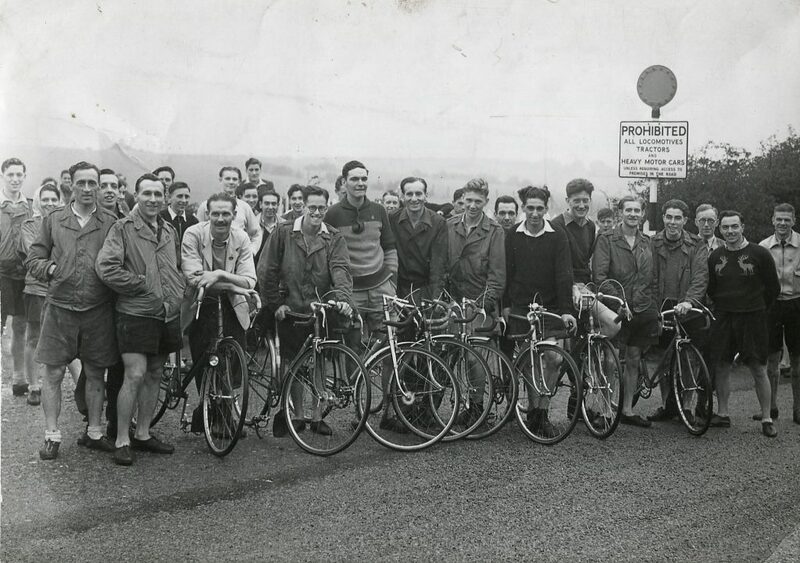 In 1951 Warrington Road Club had 39 riders in the MDTTA 100 Time Trial event which is unprecedented in any era of club cycling for an event of this distance. The Club’s activities would flourish under traditions set from this era and long before. One of note was the Hobo Run, or Tramps ride, that was very common of this time. Pictured is a 45 rider Hobo run from the early fifties with the likes of Stan Jones, Alan Barker, Charlie and Inez Finch, Johnny Helms, Reg Devonport and Stan Lea in attendance to name but a few. 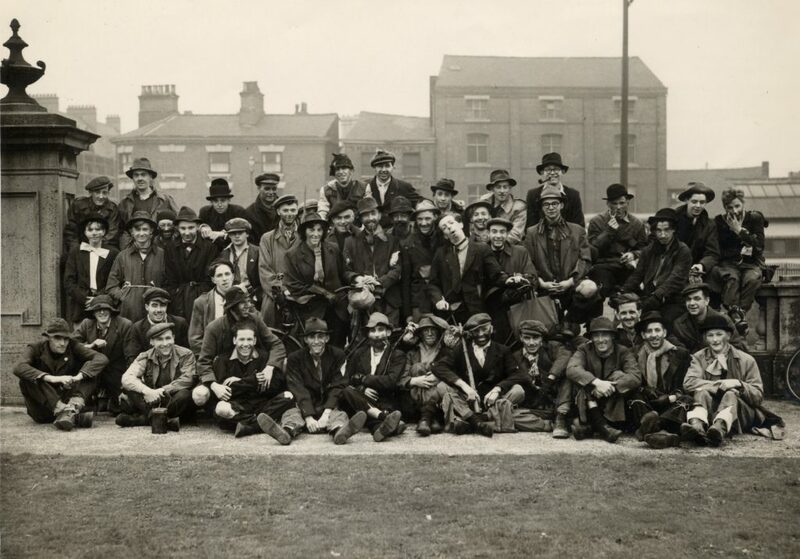 Warrington Road Club, Tramps Run Circa 1950-55, most names available on request. Cycling activities run by members are something that continue to this day, from trips to Wales, Yorkshire, Majorca, or weekends away. This is something that club members have been running since the club began. 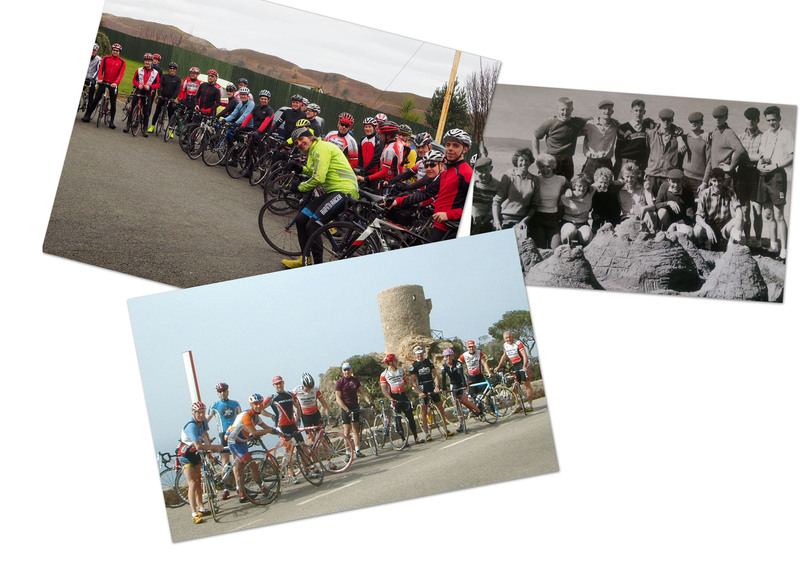 Whether it is get-togethers like Hobo Runs, Races, Events and Competition Days, or Club Trips out home and abroad, or simply weekly organised rides, an active club is a healthy club which is something we’ve maintained for nearly a century throughout each season. Current popular trips are Conwy in early March followed by Majorca in mid-April. At the end of each year since the late 1920’s, the club has run an Annual Dinner and Prize Presentation evening where the club and its members recognise the season’s trophy and medal winners. This has always been an opportune occasion for all club members, friends, family,guests plus riders from other clubs we know well to get together at the end of the year. We invite a special guest of honour to the dinner, previous guests being the likes of Ray Booty, Bill Bradley, Joan Kershaw, Paul Carbuttand more recently Les West, Sarah Storey, Johnny McAvoy and Richard Handley. 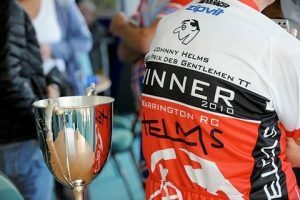 Whilst Warrington Road Club has run a 2up 25 Mile Team Time Trial for some time, the club did change this event for a number of years to a Gentleman’s Grand Prix event in honour of the late Johnny Helms. We were one of the first clubs in the country to run an event like this. The teams of two must include a Vet (40+), who is the ‘Gentleman’; the other rider is the pacer and must be a Senior (39 and below). The Gentleman isn’t allowed to pass the Senior rider until 1 mile from the finish. The Gentleman with the best handicap time would win the event (there was also a trophy for the fastest team on the day). This was a very popular event.Clubs from all round the region came to the event putting dozens of riders on each corner of the Cheshire course to cheer all the competing riders on. Pictured from our 2up events from our own club are Ron Spencer with Gordon Leicester, Trevor Horton with Glen Longland and Rod Brooks with Steve Hankey. 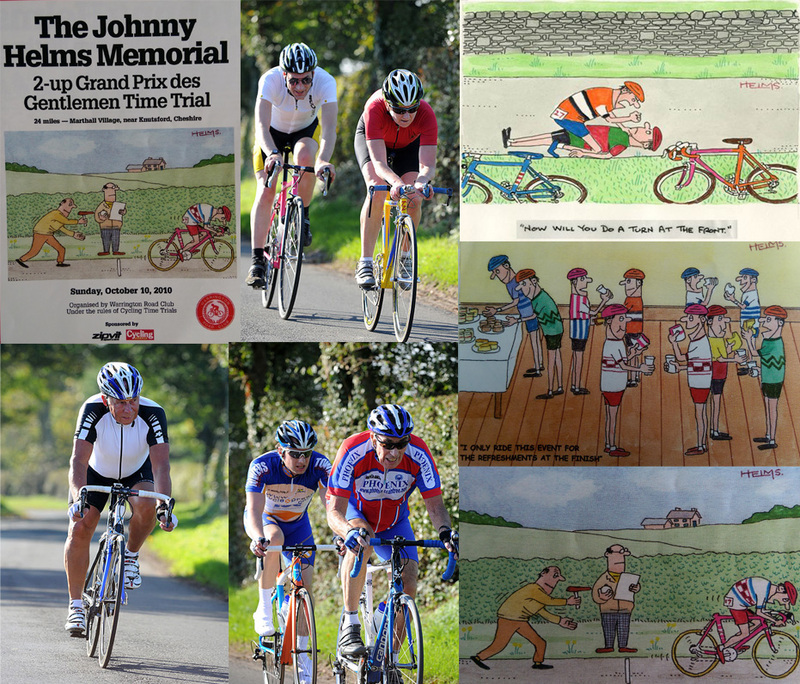 Johnny Helms was well known throughout the UK due to his work in the Cycling Weekly magazine for decades.Hence the event attracted top riders from years gone by to current day from all over the country. Top names like Graeme Obree with Yvonne McGregor, Johnny McEvoy with Barry Hoban, Julie and Terry Dolan, Alan Clark with John Geddes and Matt Middleton with Stan Brittain. Older cycling stars turning up at the same race as the up and coming riders was a real treat. 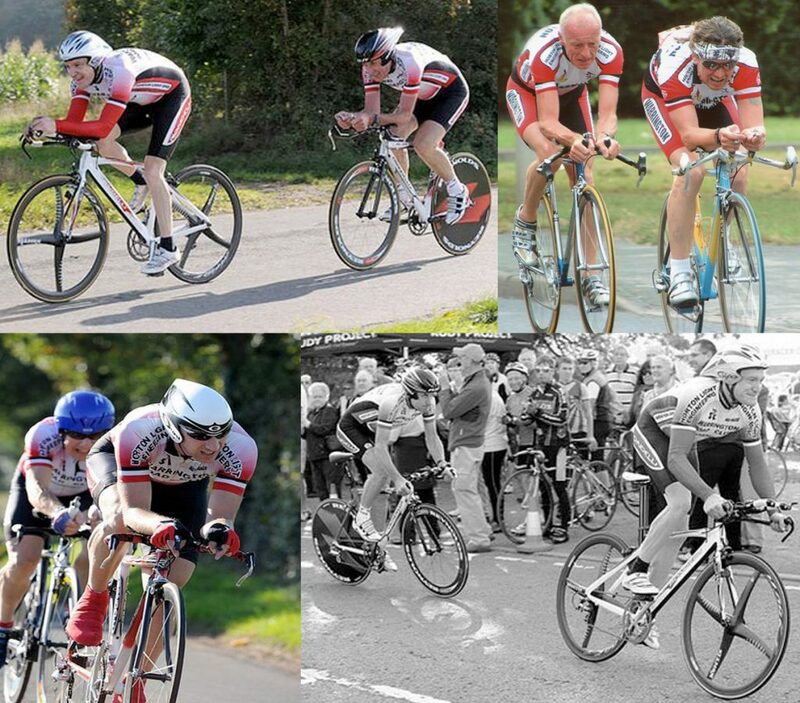 Having riders like Les West, Glen Longland and Andy Wilkinson in the same event as current young professionals like Ryan Mullen, Dan McLay, Matt Cronshaw and Richard Handley, racing on our local circuits, is certainly something to remember. Pictured from the day of the event is the front cover of the programme sponsored by Cycling Weekly and ZipVit, next to Graeme Obree and Yvonne McGregor (top middle), bottom left is Barry Hoban next to Matt Middleton and Stan Brittain (Bottom Middle) plus some classic Helms Cartoons on the right. One individual we must thank with regards to the written history of Warrington Road Club is Johnny Helms. Although the history detailed on this page and the Riders and Records page has been put together from numerous sources within the club’s archive, the vast majority was written by Johnny Helms circa 1998. 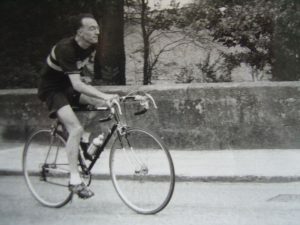 Johnny Helms joined the club in 1946, the same year that he had his first cartoon published in the magazine ‘Cycling’ (now Cycling Weekly where they are still published). He was club treasurer for thirteen years and chairman for ten years. He has also been magazine and press secretary. He organised road races on the Moore/Halton circuit, and ran inter-club 10s on the Cronton circuit for fifteen years. 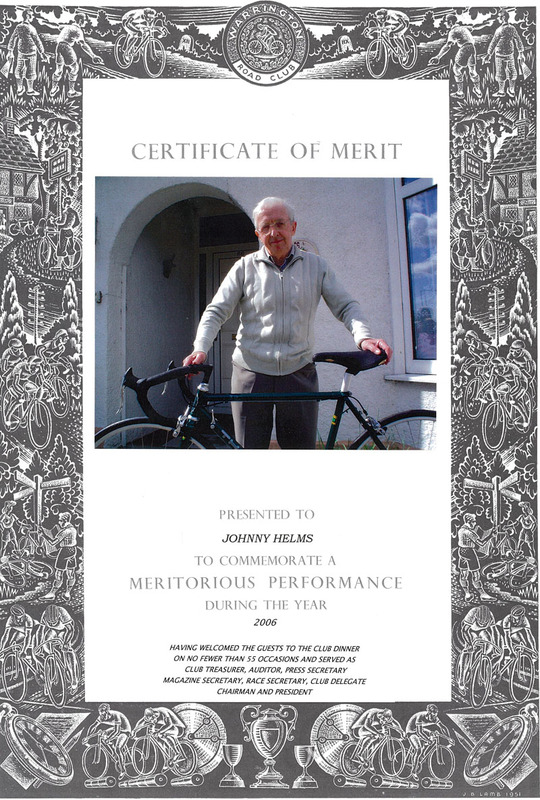 For his services to cycling he was made an honorary life member of the C.T.C. in 1995 and in 1997 he signed the Golden Book of Cycling and was awarded the prestigious Bidlake Trophy. Pictured are Inez Finch, Alan Barker and Johnny Helms. Special Thanks should go to Arthur Turner who recorded our wins and records for many years and to Johnny Helms for writing the bulk of the information that the Club History and Riders and Records pages were built on. Many thanks to Harry, Alan and Dorothy Barker, Anne Stevenson, Brian Yuile, Alan Ottiwell, Phil Gregory, John & Mavis Pressage, Thomas, John & Ian Haddock for time spent on recording data, collecting photographs, historical and inspirational information plus a large amount their personal time and thought that goes in to putting this all together in one place. We certainly hope it serves its purpose as a history of our club moving in to the present day. 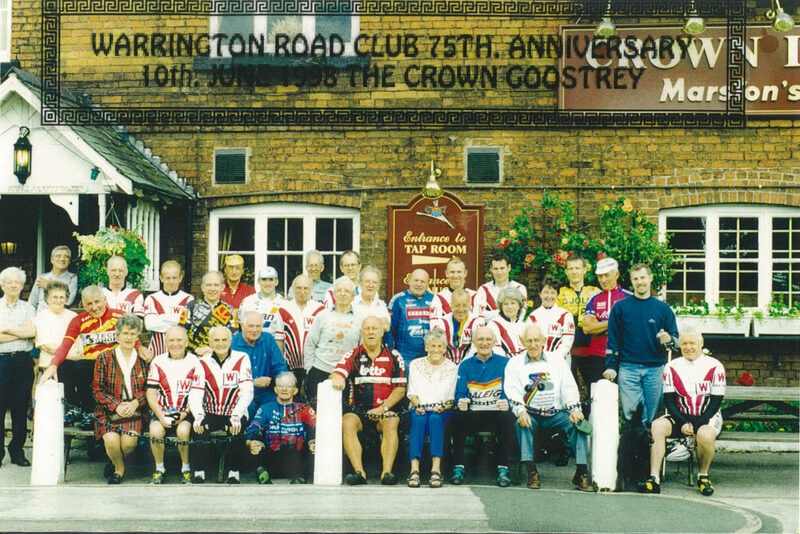 Warrington Road Clubs 75th Anniversary ride to The Crown, Goostrey. 10th June 1998. We’d also like to thanks some of the people who have provided the photography on this web site as the visual element really helps to bring the site to life. Ellen Isherwood who turns up on our local races circuits in the north west each week has kindly granted permission for us to add in the racing pictures free of charge, many thanks for your efforts. Andy Jones from Cycling Weekly has also provided a number of photographs for the site when we had our ride with them in January 2018. Other thanks should go to Peter Lloyd, Paul Best, Martin Holden, Adrian Japp of WVCC, James Russell who stand on roads in all sorts of weather taking photos so we can all have a look back in the comfort of our own homes. Your efforts are appreciated. Further thanks should go to members and former members mentioned in the above paragraph who have contributed with photographs as well. One of Helms’ final notes is as follows: “The magazines and newsletters have often been sporadic and the recording of events and results has often been scanty. It is certain that some events and members are missing from this report and for that we apologise. Whatever the shortcomings we hope this history gives a picture of a highly successful club.” This statement still stands today. Please also refer to our Thanks Page where thank the people who have contributed greatly to our club over the years. The Warrington Road Club Certificate of Merit, Johnny Helms. If you do have any pictures, stories or additions you believe should be added, we’d be happy to hear from you, so do contact the club through the contact page in the web site.